This week we will be making a move that we have every 3 years or so now, to find home in a new office. In the past we have kept a great tradition with this, every couple of years when our lease is up going to a new office, mostly in the Palatine area. The main focus was cutting down on costs, so we still wanted to stay local. Now we aim to combine our operations with our partners, Excel Electro Assembly Inc. in Elk Grove Village. Excel is a company that some great engineers working with them. They make computer chips along with building and assembling some products for us. 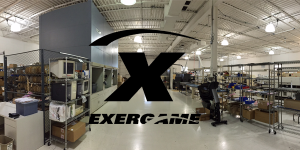 Without their help, we would have not have great products like the Exerbike. At our now old location, we had a smaller warehouse area for products, parts, and a quick showroom to a few who have stopped by. Excel has the perfect facilities to make us feel right at home, a warehouse, office space and all, and even a kitchen! (we were lacking one at our last office). By making this collaborative effort we will majorly cut down on overhead and operational/shipping costs, and hopefully more unforeseen costs. Through this we hope to pass this savings onto the customer. More efficient shipping/processing times, more accurate product troubleshooting/repairs, and the best customer service we can offer are our goals for this move. Efficient communication styles and creative problem solving are two major areas of focus that can also be improved and worked on here. This is possible by having everyone under one roof with the same direction in mind. Instead of having to digitally communicate everything with our partners and go back and forth, potentially wasting time for the customer, we can now solve things in half the time. We have enjoyed our many years working in Palatine and will not forget it soon. With this move like any move, things will change. For some this may change their commute, others it may change where they stop for lunch, but for a company it will change how well we run for the better. Our minds are always on our customers and our focus will continue where ever we may be. We are excited for the future and will continue to be the leader in the Exergaming world by being the #1 provider of interactive fitness & gaming products. If you would like to see some photos of the process of our move, view our SmugMug gallery here.